St Giles was born in Athens, Greece, and lived his early life as a hermit in various retreat centres in Southern France. 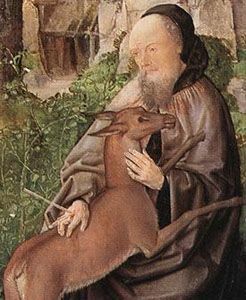 Although legend links St Giles with Arles, he withdrew deep into the forest near Nimes and spent many years in solitude and prayer, living on a vegetarian diet and the milk from a tamed deer. His quiet retreat was finally discovered by the local king’s hunters when they wounded his deer with an arrow and followed it to his hideaway. The King, who held St Giles in great esteem, built a monastery for him in the valley of Saint-Giles-du-Gard; it became the origins of the town, St Giles. St Giles was renowned for his “sanctity and miracles” and his monastery flourished under the Benedictine rule, with pilgrims arriving from great distances. St Giles died at the monastery. Knowledge of his life spread across Europe and numerous other churches and hospitals were built in his honour. St Giles’ Feast Day is the 1st September. He is the Patron Saint of beggars, the disabled and Edinburgh in Scotland. He is also one of the fourteen popular German Holy Helpers which includes St Blaise, St Barbara and St Christopher; often invoked at times of difficulty and at the hour of ones death. Pray for us that we will give our time to the most loving of all our friends, Jesus.